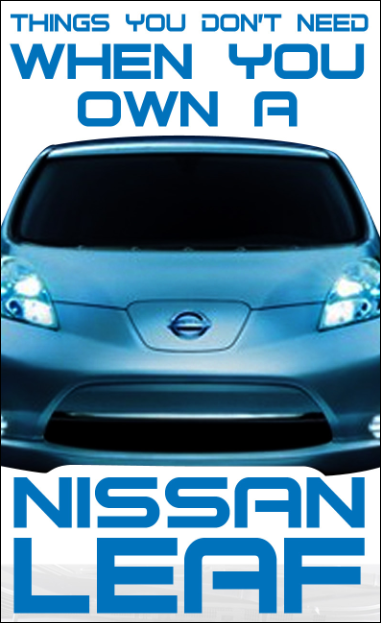 A few months ago, I started a thread on MyNissanLeaf.com, a Nissan Leaf owners forum, about “Things you don’t need when you own a Nissan Leaf” – click here for the original post. I’ve been using the Nissan Leaf for my commute to San Francisco for a bit over a year – and for about $15 dollars I can drive about 1,000 miles (1,600 km). With a Leaf, or really with any electric car, not only you save a ton of money on gas – but you also save a lot on maintenance and parts. A picture is worth a thousand words, so thanks to bespoke and http://www.design911.com/ all of that information was analyzed and an awesome infographic was created. 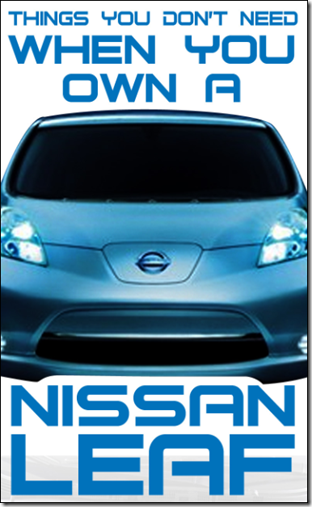 Nissan should hire us for their marketing campaign. This page contains a single entry from the blog posted on June 24, 2012 1:48 PM. The previous post in this blog was How to stop a 'Denial Of Service' (DoS) attack on your ASP.NET web site, aka "Using the 'Dynamic IP Restrictions' IIS Extension on Windows Azure with a Startup task". The next post in this blog is ‘My Money Converter’: a great currency converter for Windows 8, Windows Phone, Android and iPhone.